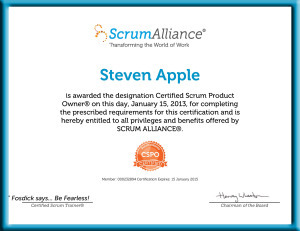 Steve is a Certified Scrum Product Owner (Scrum Alliance, January 2013). What does that mean? It means the work he’s been doing for quite a while now has the blessing of the Scrum Alliance. Steve is qualified to write stories and create products, as well as identifying customer needs (since customers determine the success of a product). Steve develops strategies to meet customer needs by brainstorming to figure out ways to make new products, as well as enhancing current products, capable of meeting the demands of the users and keep the company competitive within the industry. He works with development and the client throughout the product development cycle to ensure that everything is done according to specifications and the product meets the product owner’s needs. The Certified Product Owner® (CSPO) course is taught by a Certified Scrum Trainer®. The CSPO course is designed to cover all the basics of Scrum and also provide a large amount of material devoted to the Product Owner role.